Many Filipinos look forward to breakfast each day to enjoy the famous tapsilog, which is made of tapa (cured pork or beef), sinangag (fried rice), and pritong itlog (fried egg). This business focuses on giving its customers variations of that popular meal, and more. Local consumers naturally prioritize value for money. That is why cheap but filling meals will always be popular in the market. What can you possibly buy with P20? Aside from that heavily advertised brand of ice cream, the amount can now make you enjoy a sumptuous tapsilog (tapa or cured pork, sinangag or fried rice, and pritong itlog or fried egg) meal. You probably have heard about this simple fast food joint called Bentesilog. 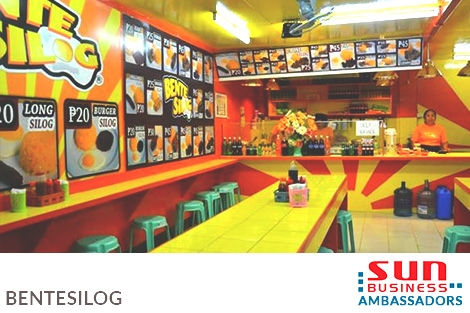 As the name suggests, it caters to customers who are looking for very affordable ‘silog’ (sinangag and pritong itlog) meals. Its main enticement is the attractive food price, which ranges from as low as P20 to just about P75 per meal. Of course, the cost may depend on the size of (and variations) servings. However, what surprises most consumers is the uncompromised quality and taste of each ‘silog’ meal. Moreover, the very reasonable cost does not limit the variety of menu choices. One can choose from Bentesilog’s bestsellers: longsilog, hamsilog, and burgersilog (with longganisa, ham, and burger patty as main viand, respectively). The menu even offers several uniquely combined and named combos. You may try chicsilog (fried chicken), embosilog (cured sausage), and tinapasilog (smoked bangus or milkfish). Not surprisingly, Bentesilog is popular among students, jeepney drivers, and just everyone who is on a tight budget. Interestingly, ‘silog’ meals are also served all day long, not just for breakfast. But unknown to most of its customers, Bentesilog is more than just another popular eatery. It is actually a family managed business. The father-and-daughter tandem of Dennis and Aiza Therese Soriano is behind the successful enterprise. They have been in the tapsilog business for more than four years now. Bentesilog is also a promising franchising opportunity for other entrepreneurs. In fact, many of its locations across the metro are franchised stores. Basic franchising package for this business requires minimum capital investment of P180,000 for a cart-type stall. Franchise fee for bigger dine-in store is about P450,000. Each package includes the standard menu board, burger griddle with accessories, uniform for crew, and about P4,000 to P8,000 worth of goods. Check out Bentesilog’s free online directory listing here.